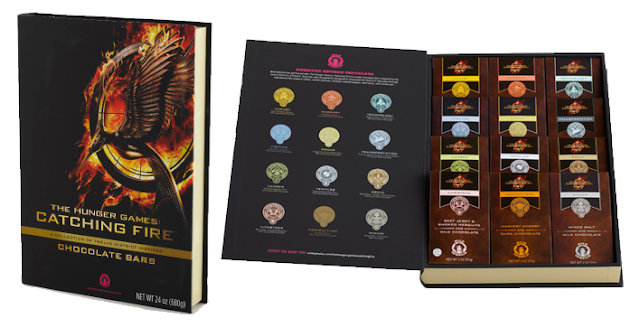 It's that time of the year, and we've got some recs for some super awesome gifts for the Hunger Games fan in your life. Our friends at Panem Propaganda have designs on Cafe Press, and we love their "The Odds Are Never In Our Favor" design, and you can get it on phone cases, bags, shirts and so much more! For the baker and Peeta fan in your life! 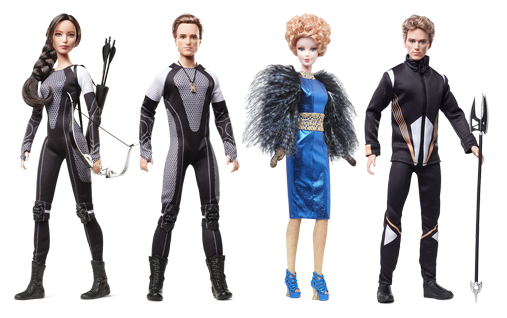 Wonderfully detailed, these Catching Fire Barbie dolls are great for collectors or just someone who likes Barbies. These guys are still available at some Targets and Toys 'r' Us as well! If you've checked out our review of these chocolates, you'll know that we're big fans. Buy the library to give your chocolate-loving loved one a taste of each district and a pretty cool box. 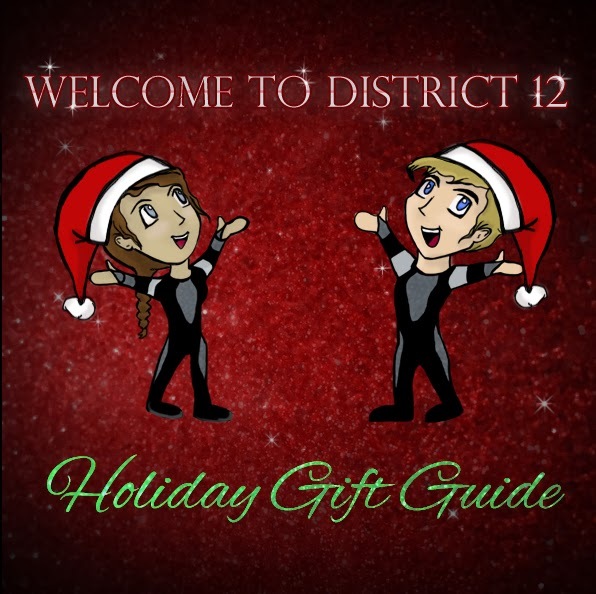 Or check out which Districts your local Walgreens has and stock up on stocking stuffers! 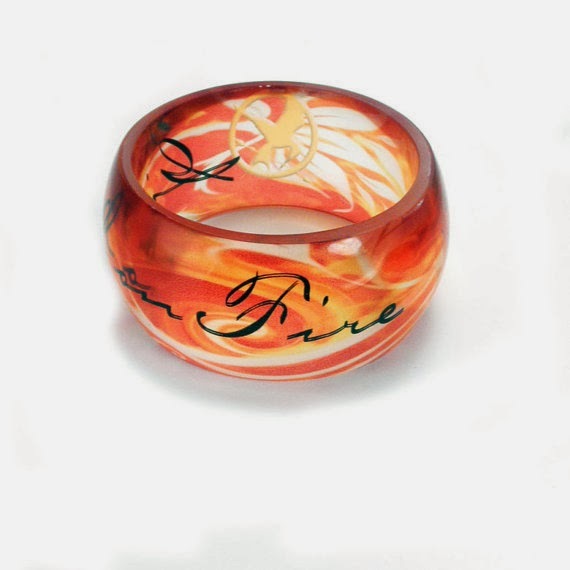 For those who'd like a Hunger Games statement piece, this bangle is for them! Each one is made to order, and the colors appear more vibrant when worn or under bright lights. Take your pick. 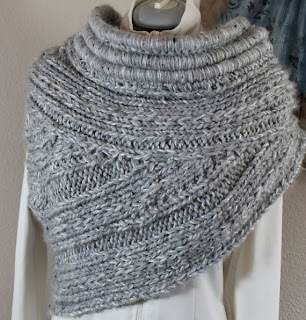 Every knitwear lover screamed "WANT!" 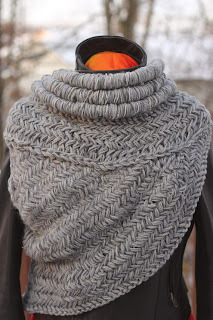 at Katniss's cowl in The Hunger Games: Catching Fire, and there are plenty of interpretations of the piece out there on Etsy. 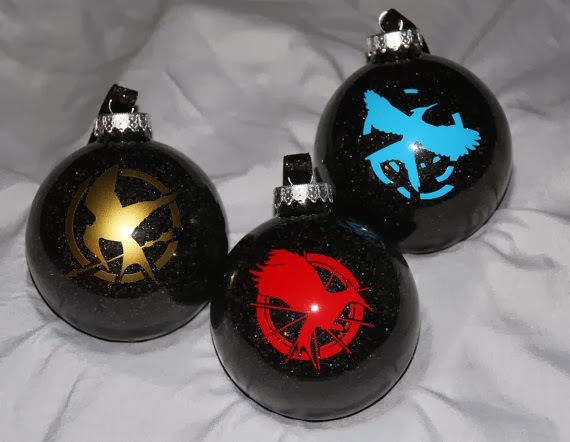 Decorate your tree with these beautiful handmade ornaments. 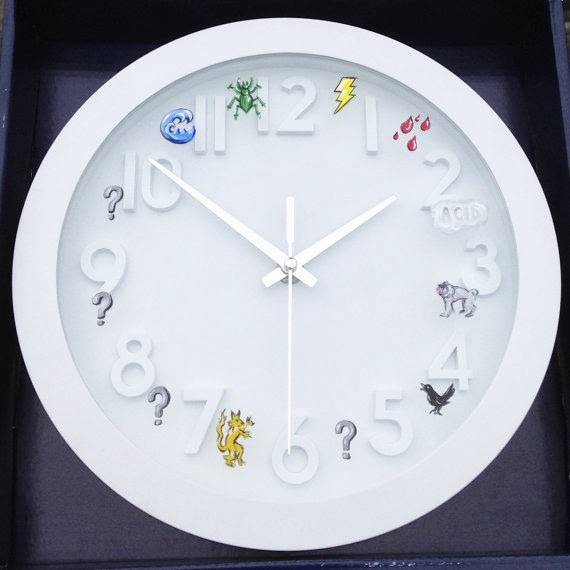 Tick tock, the arena's a clock! Get this to help your friends and family know which section of the arena to avoid. It might just help save their life. 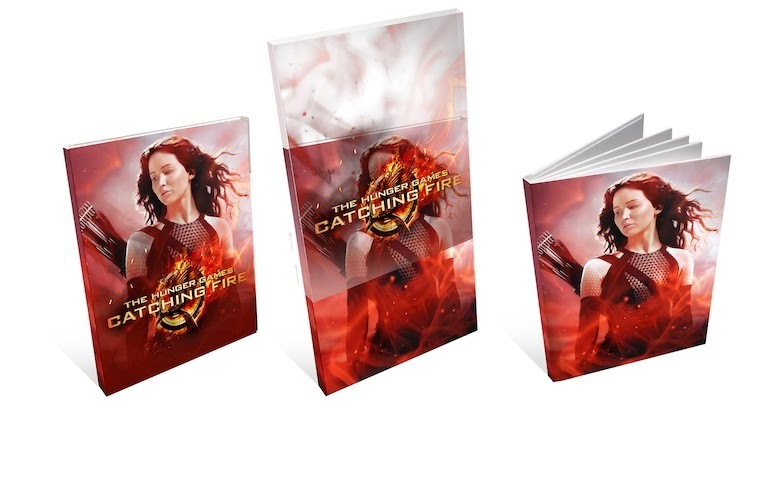 Only 100 of these extremely rare lithographs from the blockbuster movie The Hunger Games were ever made! Sold by Target to celebrate the DVD release of the movie in 2012, these high-quality lithographs are hand-signed by the 10 actors who played the main Tributes in the movie, including the big 3. Each signed lithograph is matted, framed and ready to hang! 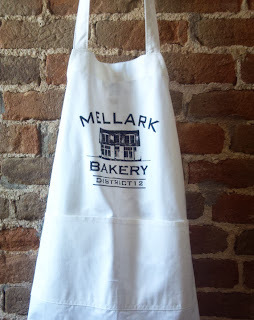 Measures 26.5x20" and comes with a hand-numbered Certificate of Authenticity. 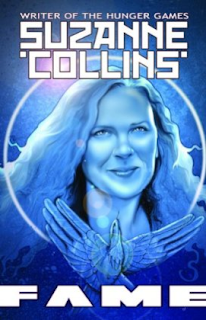 Hunger Games Examiner's Sara Gundell wrote this biographical graphic novel of Suzanne Collins. 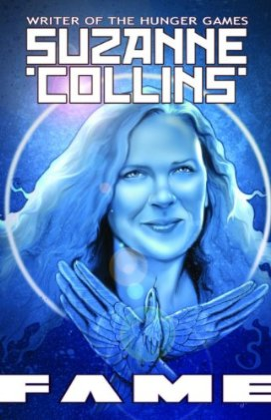 We wrote a review back in 2012, so grab this for a chance to find out about her inspirations to write our favorite book series. Christmas is only a week away! There's still time to get some of these items by Christmas, and if you're buying on etsy, well... perhaps you can get it by New Years! Jennifer Lawrence and 'Atlas' by Coldplay receive Golden Globe Nominations! Aaaaaand we have more award show news.... and probably more to com! Jennifer Lawrence - "American Hustle"Lupita Nyong'o - "12 Years a Slave"
"Atlas" - "The Hunger Games: Catching Fire""Let It Go" - "Frozen"
Also, Atlas by Coldplay was nominated for a Grammy! The Screen Actors Guild Awards nominees were announced early this morning and Jennifer is nominated for Outstanding Performance by a Female Actor in a Supporting Role for playing Rosalyn Rosenfield in American Hustle! Also nominated for the category are Lupita Nyong'o, Julia Roberts, June Squibb, and Oprah Winfrey! 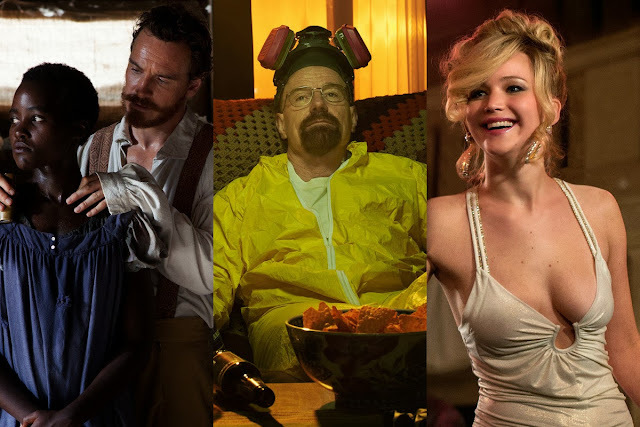 The cast of American Hustle is also nominated for Outstanding Performance by a Cast in a Motion Picture! I haven't seen American Hustle, but I am sure her chances are great! What do you guys think? 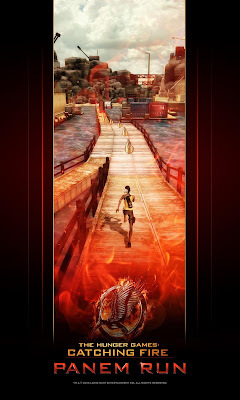 If you haven't heard, YES there is a Catching Fire game and YES it's totally awesome. Courtney: Panem Run takes the typical runner game and customizes it extremely well to the The Hunger Games brand and even takes it a few steps further. Not only can you increase your power ups by collecting different items in different districts, you can craft different arrows for the archery section. The visuals keep you on your toes the farther you get, in which several moving parts of scenery that include district obstacles that can land in front of you at a second's notice. You can earn points for your district and race your friends (or strangers) via Internet. This game proves to be delightfully challenging, visually engaging, incredibly interactive (in all the good ways), all the while turning a runner into what all other runners should aspire to be. Tiffany: Panem Run is a fun endless runner game that throws a social aspect in the mix. If you are familiar with Temple Run or Minion Rush, you’d get the idea. But it is the Facebook integration and social aspects that really help this game. 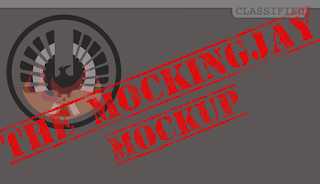 If you connect the game to your Facebook AND you have been given a District via theCapitol.pn, you can play as a member of your District, and the Districts are ranked so you truly are representing your District when you play. You can also challenge friends or random players, and to me, that’s where the fun is. Trying to best your friends and strangers is what keeps me playing and wanting to score high. As far as weaknesses go, I’m hoping that they roll out more Districts soon, and I wish there was some way to customize your runner. 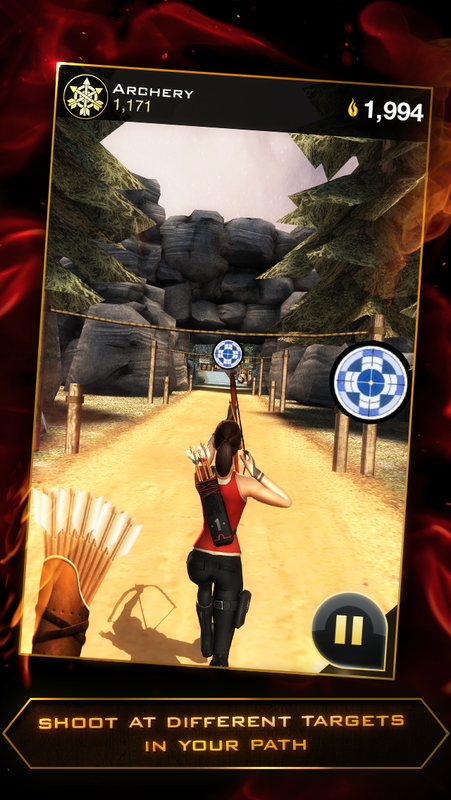 Denise: Panem Run is such a ridiculously fun game to play! I've been playing on my mom's iPad all morning. Though not all the districts are on there yet, running through the districts is a lot of fun and it shows you little things that make each district unique. My favorite (and I'm sure most people's favorites) is the times where you get to be an archer and shoot at the targets with your bow. You can also make unique bows with the sparks that you collect as well as increase your bonuses. I love that the flowers that you collect are Katniss, Prim and Rue flowers. This is an addictive running game that is infinitely better than other ones you will find. Can't wait to get max levels on all my stuff! Janine: Panem Run is so good it gives me anxiety! I do not really know what to say about it except everything looks so cool and that I appreciate the level of difficulty (thus the anxiety) and that I have slept significantly less since the app has come out. This is a very solid game for this franchise, and we hope that Hunger Games fans will start playing it so that Reliance Games is able to come up with new updates, hopefully new districts, and we'd also like to add that we'd LOVE to be able to unlock avatars of our favorite characters! 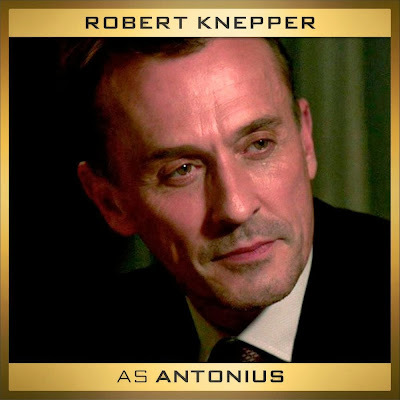 Based on the upcoming film The Hunger Games: Catching Fire, which opens in theaters worldwide on November 22, 2013, The Hunger Games: Catching Fire – Panem Run mobile game tasks players with running through the Districts of Panem, collecting Sparks and pursuing resources through the Districts. The game allows players to invite friends and fellow fans to see who can earn the most Sparks and bring honor to their District. 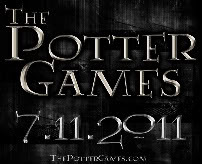 Download the game on the App Store and Google Play.Watch the trailer. 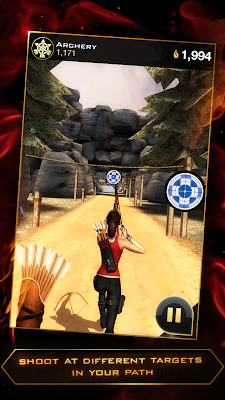 The Hunger Games: Catching Fire – Panem Run is available now on the App Store and Google Play.